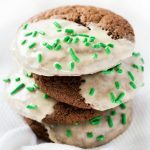 Boozy Baileys cookies are chewy chocolate cookies made with Irish cream and dipped in alcohol infused icing. This boozy dessert is perfect for St. Patrick’s Day! Happy St. Paddy’s Day everyone! As promised, I have created yet another recipe using Irish cream. 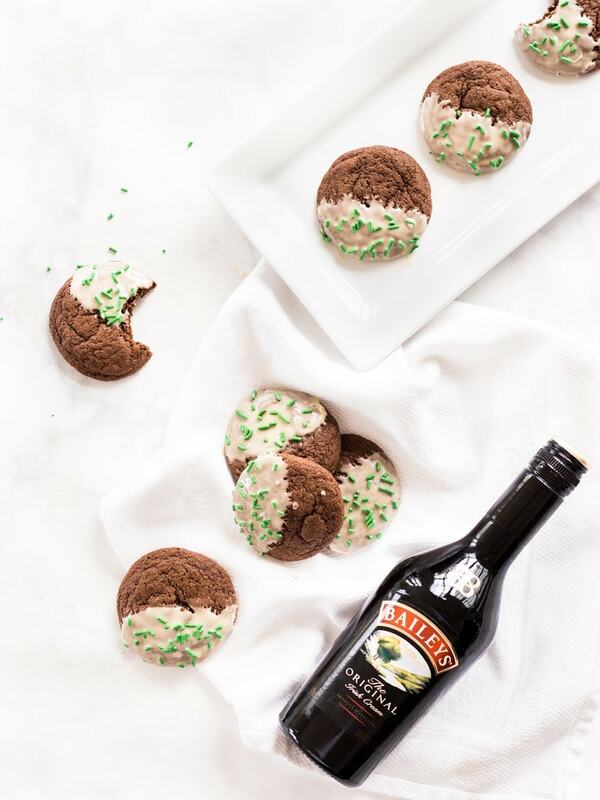 This time around I concocted boozy Baileys cookies made with cocoa and, of course, Irish cream. My Irish cream of choice is Bailey’s (classic). I’m consistently amazed at how easily Bailey’s adapts to desserts. It has such a strong and distinct flavor that it instantly becomes the star ingredient of any baked good. 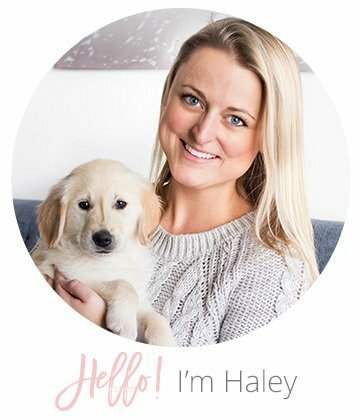 These Baileys cookies are no different. Biting into one of these cookies is pure bliss. They are extra chocolatey, perfectly chewy and filled with Bailey’s. And if the cookies didn’t have enough Irish cream, the icing really tops it all off. 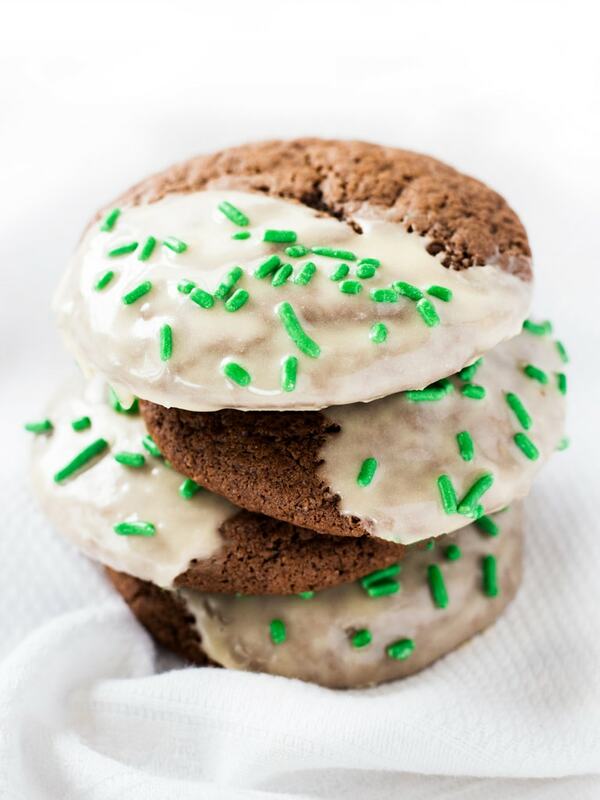 The icing is simply made of confectioners’ sugar and Bailey’s Irish cream. It gave me an excuse not only to use the Bailey’s again, but also to add a pop of green with the sprinkles! This is definitely one of those recipes that you could make year round (sorry, Patrick). Any time you’re craving chocolate with an extra kick, make these cookies. 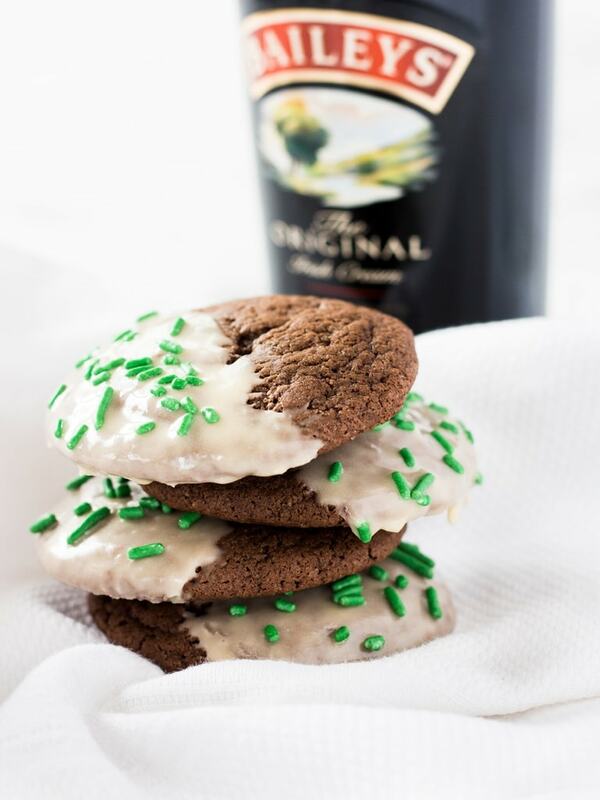 Boozy Baileys cookies are the perfect dessert to make for St. Patrick’s Day. 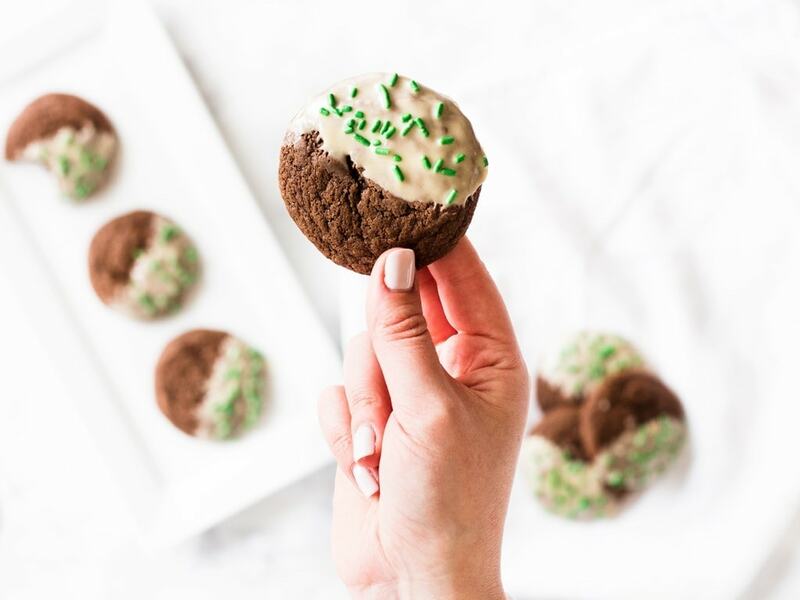 Not only are they a chewy, chocolatey treat, but they also have a kick of Irish cream to get your party started! Preheat oven to 350° F. Line a cookie sheet with parchment paper and set aside. In a medium bowl, whisk together flour, cocoa, espresso powder, baking soda and salt. Set aside. In a large bowl of a stand mixer (or using a hand mixer), combine butter, sugar and brown sugar until light and fluffy, about 2-3 minutes. Add eggs and beat until incorporated, about 30 seconds. Add Irish cream and mix until combines, about another 30 seconds. With the mixer on low, slowly add the flour mixture to the butter and sugar mixture. Mix just until combined. Scoop about a tablespoon of dough and roll into a ball. Place on cookie sheet. Repeat with remaining dough placing each ball about 2 inches apart on the cookie sheet. Bake for 8 minutes or until the edges are set and the tops of the cookies begin to crack. Cool for 5 minutes on the cookie sheet then transfer to a cooling rack to cool completely. To make the icing, whisk together confectioners' sugar and Irish cream until you reach desired consistency. 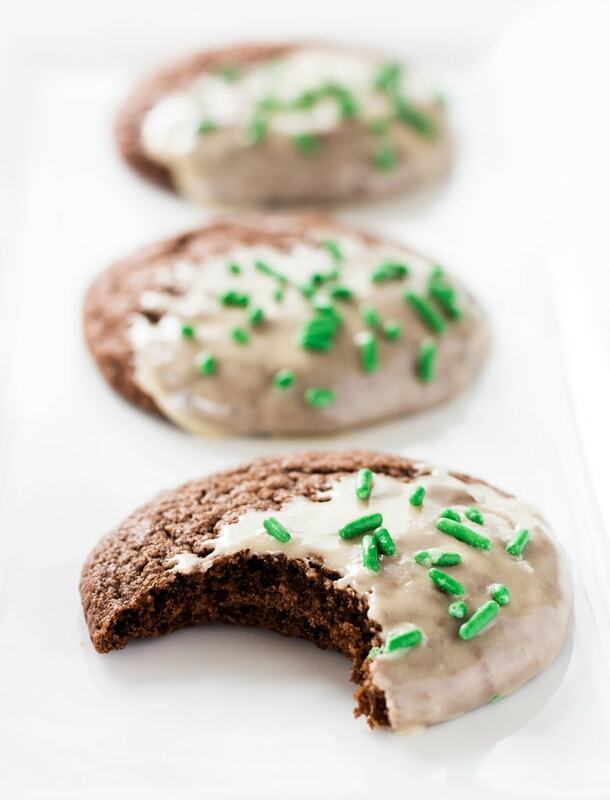 Dip half the cookie into the icing and immediately garnish with sprinkles. Store cookies in an airtight container at room temperature for up to 5 days. Inspired by Life, Love and Sugar. I love a good boozy baked treat, especially one that involves chocolate and Bailey’s! Yum!